As many have heard recently residents of Flint Michigan have been rightly outraged due to the high presence of toxic chemicals including lead in their drinking water. The question arises how did this occur and was it a forseeable incident? The backstory that led up to this incident can be generalized into a few main chapters. In this analysis we will utilize Census Data as well as US Geological Wate Quality Survey Data to analyse the Flint incident starting at the source pre-treated water as well as nearby streams in Detroit and near Lake Huron. It is not meant to serve as conclusive evidence of any kind. We will be looking specifically at chloride concentrations to see if Flint, Mi has very corrosive water to begin with. The city of Flint is located in Genesee County and this is really a story of three counties. Detroit, Wayne County that originally sold treated water from multiple rivers including the Detroit River to Flint as well as the KWA plant [under construction sourcing water from Lake Huron] (http://www.nytimes.com/2014/05/26/business/detroit-plan-to-profit-on-water-looks-half-empty.html?_r=0) located in Sanilac County. We filtered our data for high quality measurements only taken at the surface. We specifically collected data on dissolved chloride concentrations because chloride ions are the key element in contributing to the corrosion in Flint pipes leading the leaching of metals such as lead. In the second half of this story we will also cover how the addition of chlorine escalated chloride concentrations but for now we will focus on pre-treatment water quality. We now would like to see if there is a significant difference in pre-treated chloride concentrations amongst the two counties. What we care about in this plot is the average as well as the standard error of the distribution. On first glance it appears that Genesee County overall has a higher concentration of chloride in the surface water overall. Let’s see if this is statistically significant or not as their is overlap in the standard error. 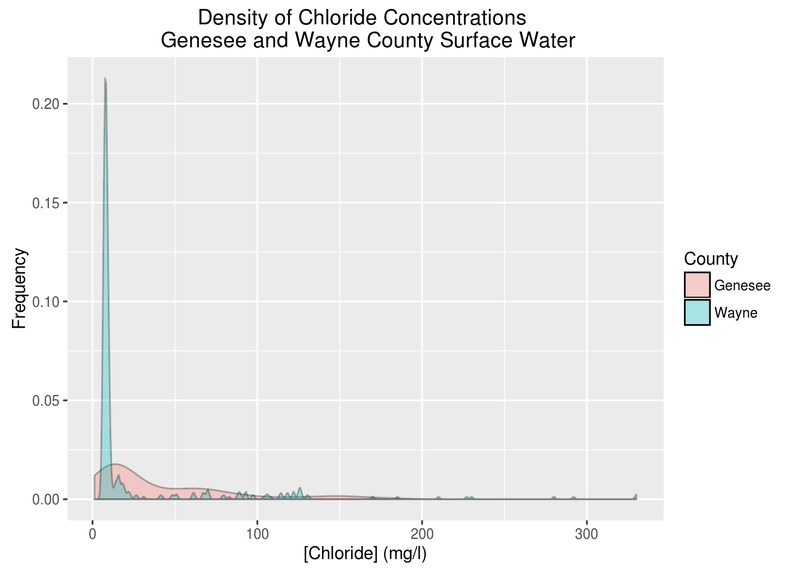 The p-value for this t-test shows that Genesee County has a significantly greater chloride conncentration in its surface water compared to Dwayne county. Remember Dwanye county houses the Detroit River AKA the old reliable and expensive source of water that Flint was sourcing its water from originally before switching. Surface Water samples taken in the County of Genesee appear to show a multi-decade historical average of 41.3 mg/l almost twice as much as the 25.4 mg/l average in Genesee County. At this point I got a funny feeling why not check the median it should be relatively close to the mean? Turns out the median was nowhere near the mean. 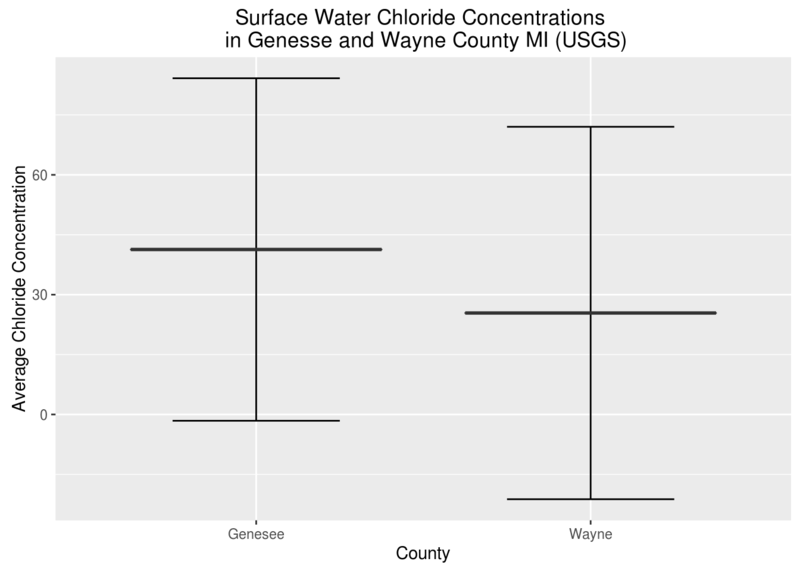 The median shows Genesee County having a chloride concentration of 21.0 mg/l and Wayne with a 8.5 mg/l concentration. Genesee County has almost 3X the pre-treatment or initial chloride concentration compared to Wayne county. The discrepancy between the median and mean could be outliers or a non-normal distribution. If my experience has taught me any thing in these circumstances I need to see the full distribution and see what is happening here. That distribution sure doesn’t look normal. It appears Wayne county has a lot of samples with low concentrations of chloride. It could be that one sampling site has so many samples that it is warping the mean and median. Perhaps what we should be doing is collecting an average by sample site and looking at the distribution of sample site averages. We have finally arrived closer to the truth. In general the rivers and lakes in Genesee County appear to have a much lower chloride concentration than those in Wayne County. We originally thought initial chloride concentrations would be high in addition to any chloride ions produced from the additional chlorine added to kill bacteria however this does not appear to be the case. It should be noted that Detroit also sourced its water from Lake Huron. This analysis also looked at bacterial measurements but found Flint, MI did not have enough samples taken from the USGS to warrant a similar analysis on bacteria concentrations. The lack of initial high corrosivity in the rivers relative to nearby counties as seen in the interactive map suggests that initial chloride concentrations may not have been the main contributor to corrosivity and instead the addition of chlorine to remove bacteria may have been the main contributor to the water corrosivity.